King Of Beers: SABMiller Agrees In Principle To Merger With Budweiser Brewer : The Two-Way If the deal is formally agreed upon, the company would own around 31 percent of beer sales around the world. SABMiller, owner of Miller Genuine Draft beer, has agreed in principle to merge with Budweiser brewer Anheuser Busch InBev. If the deal is finalized, the new company would be the largest beer company in the world. After rejecting a number of earlier offers, British-based beer company SABMiller accepted in principle a 69 billion British pound ($106 billion) offer from Budweiser brewer Anheuser Busch InBev. 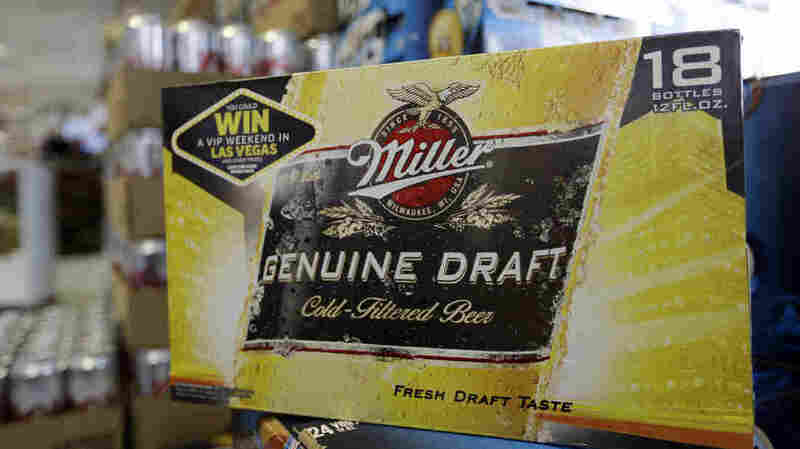 If Tuesday's agreement is finalized, the new beer company will be the largest in the world and control two top U.S. brands in Budweiser and Miller Genuine Draft, according to The Associated Press. SABMiller rejected at least four other offers before provisionally accepting the offer that values SABMiller at 44 pounds (about $67) per share, 6 pounds (about $9) more than AB InBev's first offer a month ago. As we reported last week, SABMiller turned down a $104 billion cash bid from AB InBev — the company's third offer — saying AB InBev "still very substantially" undervalued the maker of Miller Lite and Coors.
" 'SABMiller is the crown jewel of the global brewing industry, uniquely positioned to continue to generate decades of standalone future volume and value growth for all SABMiller shareholders from highly attractive markets,' says SABMiller Chairman Jan du Plessis. "With its roots in South Africa and its current headquarters in London, SABMiller's board unanimously rejected an offer Wednesday that values the company at 42.15 British pounds ($64.34). The board had already rejected two recent AB InBev purchase bids, including one on Monday for 40 pounds and an earlier offer at 38 pounds." The AP notes that the size of the company, which would dwarf Heineken, the next biggest in the industry, may spur regulatory concerns over consumer choice and competition, especially in the U.S. and China. However, the markets think a formal agreement is "likely" and "SABMiller's shares were trading right near the bid price. In midmorning trading in London, they were up 8.8 percent at 39.42 pounds," according to the AP.